Please send a PDF of your job posting to office@afpglac.org. Be sure to include how applicants are to apply for your position and where they should submit their documents by embedding the link within the PDF. Do not send link separately in your email message. If an employee of your organization is a member of AFP, you may use that membership to get the member rate. We will need the member’s name and email address in order to confirm membership is current. If have any issues with rates and/or posting, please contact the office at office@afpglac.org. You may pay by check or by online credit card processing. For credit card processing click on the button above that says "pay now". *Important* Your position announcement will not be posted or sent to the Membership via e-mail until receipt of payment. Paid position will be posted within 2 business days. All position announcements are posted on the AFP GLAC Job Center for two months. 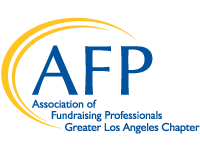 Position announcements are also distributed via e-mail to current AFP GLAC members who have opted to receive these notifications - approximately 400 fundraising professionals in the greater Los Angeles area. Pre-payment is required to process a position announcement with AFP GLAC. Please send your final verbiage. Any changes after posting will incur a $50 re-post fee and a $75 second email blast fee. 3/7/19 Grant Writer Catholic Charities of Los Angeles, Inc.